Why are our Allergens Villains? A few weeks ago, Hubby and I sat down to plot the course of Allergy Superheroes for 2016. It’s hard to believe we’ve been around for more than a year, and been “open” for almost a year. We’ve had a lot of ups and downs, and learned tons of things along the way. One of our potentially contentious decisions was to make the allergens into villains. As we did market research, everywhere we turned we saw products with happy, smiling cartoons of the country’s top allergens. The prevailing trend seemed to be to depict allergens as goofy, friendly types. I understand the idea of trying to remain non-threatening, and even to depict allergens in a positive light to minimize future backlash (in case a child outgrows an allergy.) But we just couldn’t get behind the “friendly” allergens. But even more important, we feel that cute allergens don’t treat food allergies with the respect and seriousness that they require. Asking a peanut-allergic child to wear a smiling peanut creates the impression that peanuts are happy, friendly, and safe–not that they are a danger. We aren’t trying to scare anyone with our villains. We’re going for cartoon bad guys, not terrifying real ones. 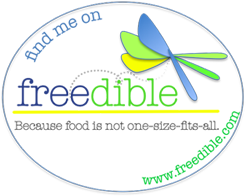 What we DO want is for them to remind children and caregivers that specific allergens are not safe for each individual child. We knew we were taking a risk by breaking the mold, but we still feel it was the right thing to do. We stand behind our villainous allergens (in fact, we keep a wary eye on them at all times.) Besides, villains fit perfectly with our theme. What’s a superhero without a nemesis, after all? I totally agree with you. I don't want to buy goofy looking characters that represent my son's food allergies. I want everyone to understand that they are dangerous for him! 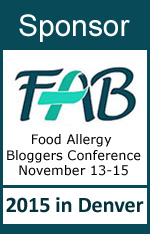 I want news, tips, and deals from Allergy Superheroes! Sign me up for the newsletter! 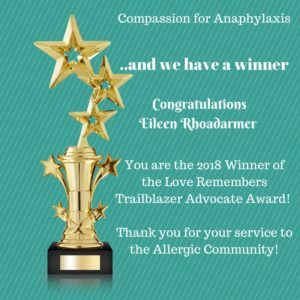 2018 Love Remembers Trailblazer Advocate Award Winner! 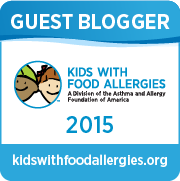 I’m a Guest Blogger for KFA! I am not a medical professional. Remember that what is expressed here is simply my personal opinions and experiences, and always consult a professional for medical advice. Some of my links are “affiliate links.” This means if you click on the link and purchase the item, I may receive an affiliate commission. Regardless, I only recommend products or services I use personally and/or believe will add value to my readers. I am disclosing this in accordance with the FTC’s 16CFR, Part 255. Your support is much appreciated and helps to keep us going!